In my last post I argued that we might be in a place in presidential politics where novelty, or the ability to create “high valence” moments carried more weight in presidential politics than in the past where organization and money was of utmost importance. I argued that is was difficult for Mitt Romney to create positive valence moments and as such might struggle down the line. Today after his big win in Florida, he makes the unfortunate comment that he isn’t concerned with the very poor in America. I’ve already seen this circulate on Facebook and Twitter a few times. His propensity to only create negative “viral moments” hasn’t hurt him yet. 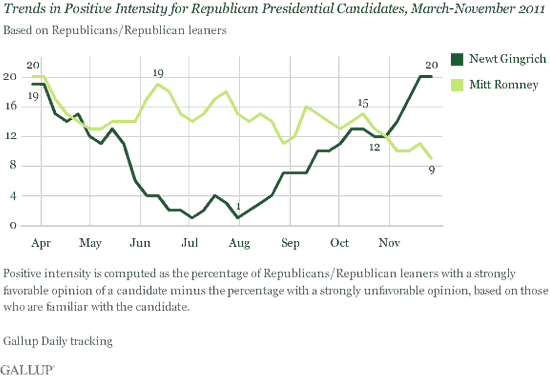 Gallup has him leading his rivals in the national polls for the first time since New Hampshire but Gallup also has an intersting “intensity index” that finds Romney scores low in intensity of support for him as a candidate when compared to Gingrich.